It takes a while to forget a true sports car. Massive engines, sonorous exhaust notes, and evocative styling tend to leave a lasting impression. Aston Martin is no stranger to this, often making legendary cars that epitomize cool and are remembered for ages. They also made the Virage. That’s right: Only seven years ago, a gorgeous Aston Martin model with a six-figure price and the company’s signature V12 engine note became available to buy new. 18 months later, Aston cancelled production of the car and we all collectively forgot about it. That’s shocking, as while the occasional consumer car flops so hard that it’s pulled in a few years, big Astons tend to have long shelf lives. It’s not all too uncommon for exotics to soldier on for nearly a decade; the DB9, which was sold alongside the Virage, survived 12 years on the market. Even off-the-wall supercars like the Zenvo ST1 and Spyker C8 can soldier on for ages. We’re up to 18 years on the Spyker C8 and an updated version is still in production. Around the Jalopnik offices, the only short-lived supercar without an explicitly limited-production run we could think of was the MP4-12, which just evolved into the 650s after three years. So, dear reader, you may be asking why the Virage was so short-lived. You’re probably asking this because, like everyone else, you have forgotten the three or four things you ever bothered to learn about a car that absolutely doesn’t matter. Allow me to refresh your memory. The Virage debuted in 2011, created by a product planner who probably was worried that he hadn’t planned enough new products recently. So they decided to fill the “white space” between the company’s DB9 and DBS models. Now, the DBS and DB9 were both front-engine V12 Aston Martins. Faster than traditional coupes but still comfortable long-haulers, they were prime examples of Aston Martin’s core competency: the grand tourer. The DB9 was softer, older, cheaper, and offered four seats rather than the DBS’ two. I know what you may be thinking: it sounds like there is absolutely no white space between these two cars. Well, had you worked at Aston Martin around the turn of the decade, that would have been a good concern to voice. But nobody did, so the Virage was greenlit. 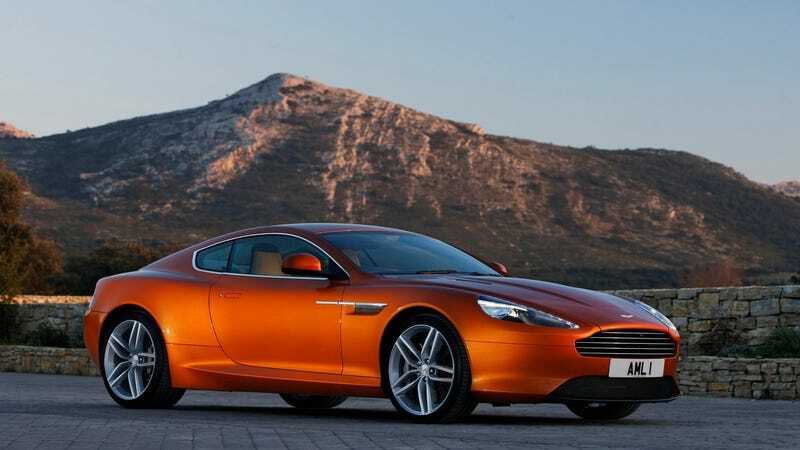 As infamously pointed out in a Top Gear review, the Virage split the DB9 and DBS down the middle. It’s 490-horsepower mill was either a detuned V12 from the 510-hp DBS or an uprated motor from the 470-hp DB9, depending on if you’re glass-half-full or glass-with-20-fewer-horsepower kind of person. It’s $209,995 starting price was $22,000 dearer than the DB9 but significantly less expensive than the $271,660 DBS. While the Virage didn’t offer three seats to truly ride the middle, it was available with four or two seats. In every way, it was slightly better than the DB9 but no match for the DBS. It also lacked the name recognition of either. This could have been solved if it launched to any fanfare, but a slightly worse version of the DBS isn’t something that’s going to grace the cover of Motor Trend. Reviews were generally positive, but with no new innovative technology, slightly-changed styling from other Astons, and the same engine it was never going to get people excited. Especially not people with $210,000 to spend. The Virage was quickly pulled from the market, as slow sales made the suits in Gaydon realize that the “white space” didn’t actually exist. The DB9 received a minor power bump shortly thereafter, demonstrating that the entire debacle could have been avoided with an ECU reflash and a bit of common sense. Luckily, this blunder by Aston Martin has been completely forgotten as a result of how uninteresting the car was to begin with. They also probably forgot to fire the boneheaded product planner, which explains the Cygnet. Correction: Due to a grievous editing error, we somehow allowed Mack, our beloved intern, to assert that the Aston Martin Virage is a “supercar.” It’s not a supercar. It’s a high-end GT sports car. We deeply regret the error, and the editor responsible for it has since been executed. Mack lives, for now. – M.B.